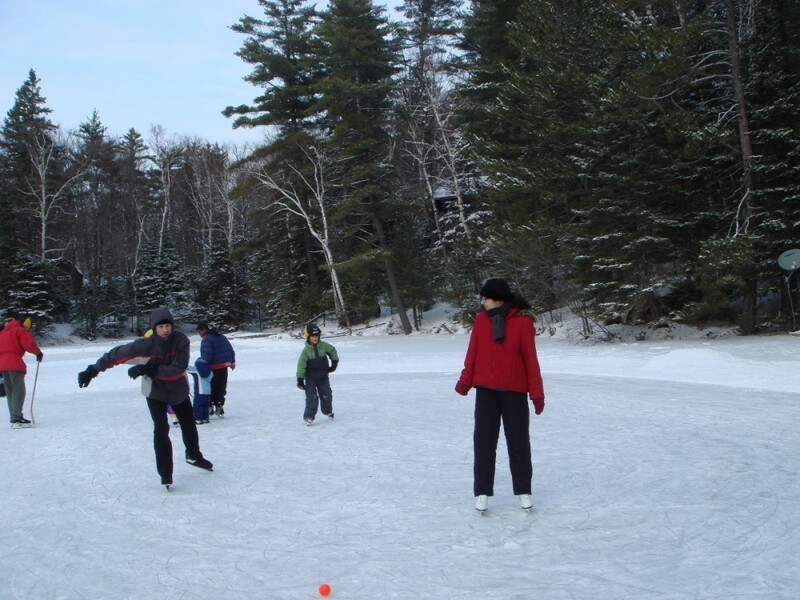 See all our activities to enjoy in winter around Happynest. 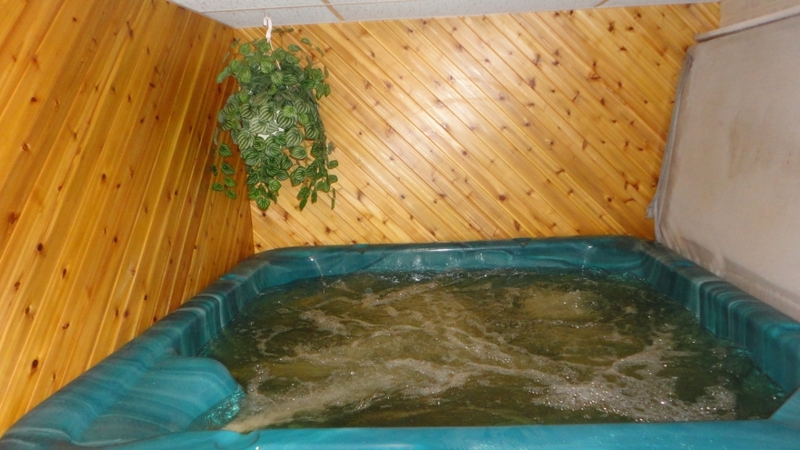 We invite you to make use of our private hot tub and traditional wood fired sauna. 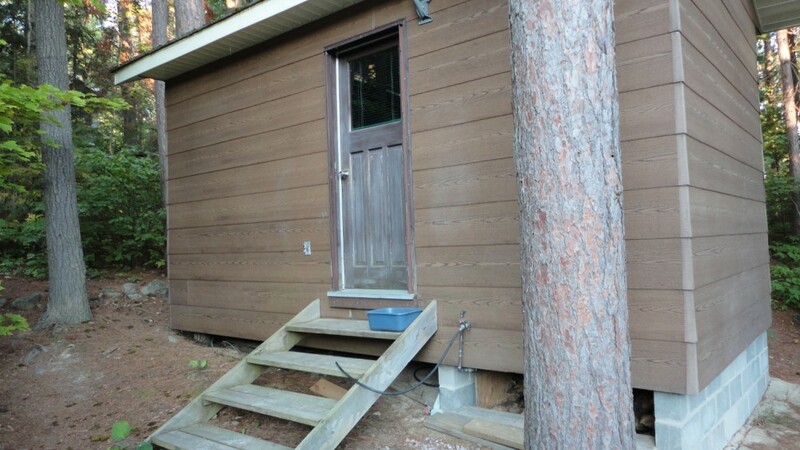 Part of our service is to prepare the sauna for you and if you are not familiar with the benefits of the sauna tradition, we would be happy to share what we have learned about the science of saunas. With either one, it is a great way to relax after a day of outdoor winter fun. 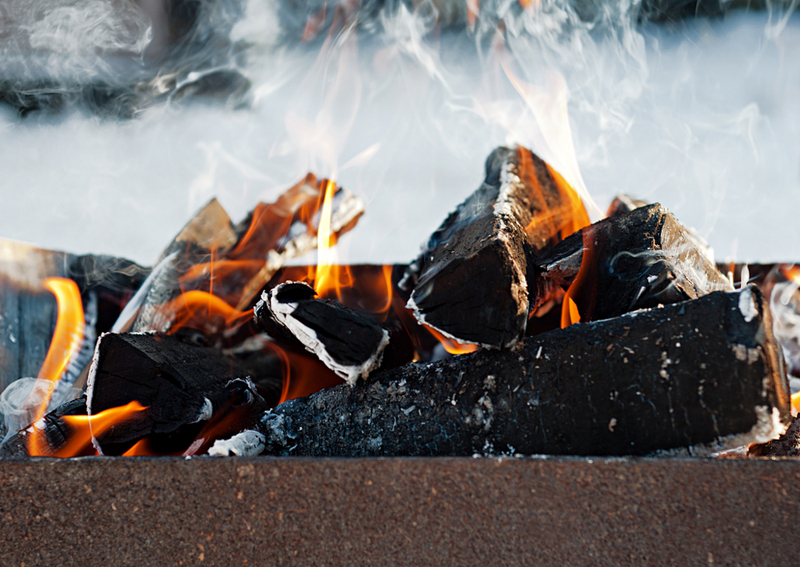 We supply all the wood that you can burn in the fireplace which will keep you toasty warm and relaxed by the cozy fire. Happynest has clean and quiet all electric heat as well with individual thermostats in every room for your personal comfort. Even the floors are warm in case you have little people crawling around on them. In winter, we keep a skating rink cleared on the ice in front of Happynest (weather permitting). It can be floodlit for night skating as well. Great for getting a little colour in your cheeks and fun for the whole family. Right on the Happynest property, there are toboggan hills. Remember that if your clothes get damp while playing in the snow, we have an electric dryer at Happynest as well. Trails radiate in every direction from Happynest and there are lots of places to take your sled where no trail permit is even needed. Typically, our lake gets ice to 60 c.m. thick of ice (2 feet) or more and we tend to get snow earlier and keep it longer than places further south. There is a circle driveway in front of Happynest so you don’t need to back up. 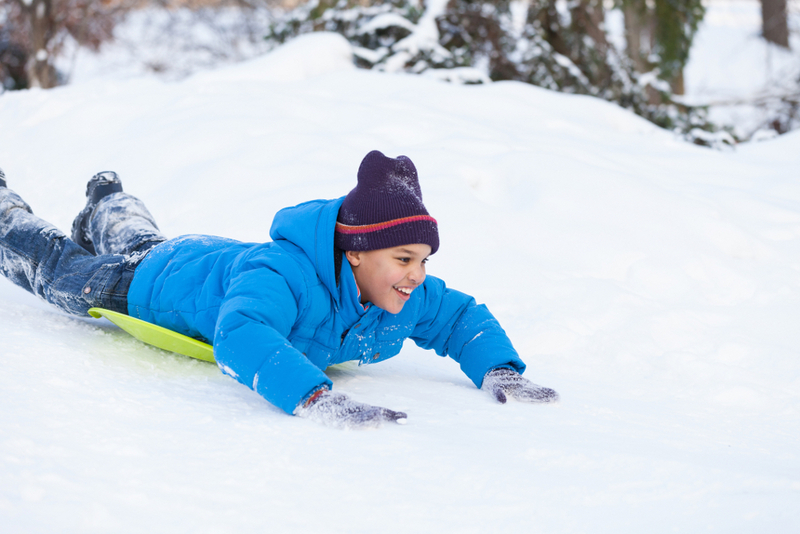 If you don’t own a sled, we can help you to arrange to rent them. If you would like to arrive by sled, we will be happy to provide you with groceries so you can prepare your food. If you reserve in advance, we can stock your refrigerator/freezer with things like frozen lasagne, pizza, eggs, bacon, bread, butter, orange juice and milk. We can provide storage for your sled too in case you would like to make several visits without having to trailer your machine back and forth. 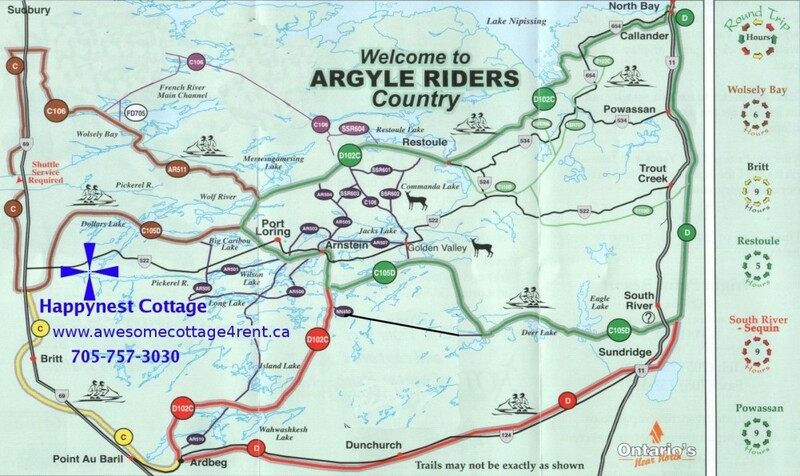 Have a look at the snowmobile trail map for our area. 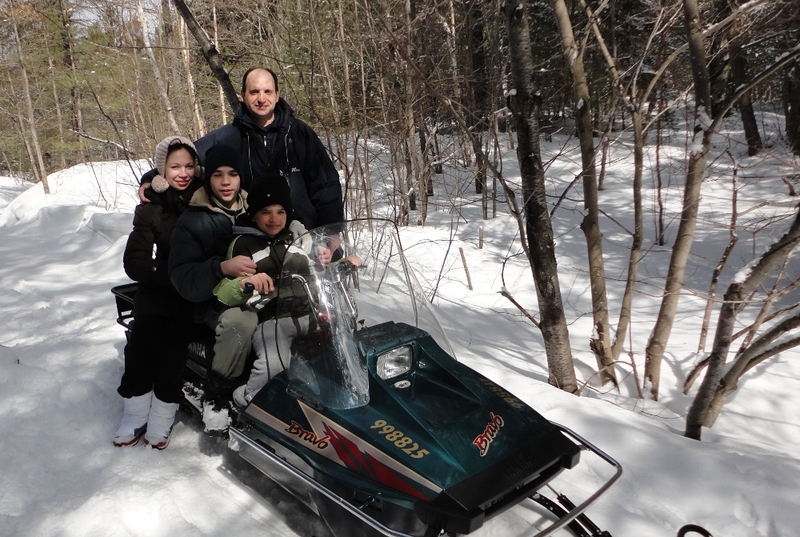 If you would just like to give your kids a snowmobile experience, we will offer to take them for an age-appropriate ride on our machine and/or sleigh. 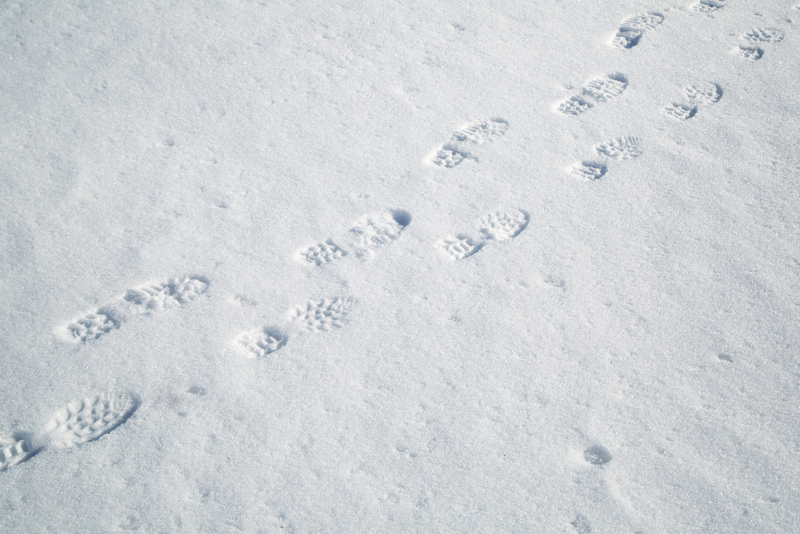 One of the winter activities we can help you with is arranging for Dog Sled Rides. There are people who will bring their dog sleds to Happynest and take you and your group out to experience the thrill of “Mushing”. It is something that needs to be planned in advance. 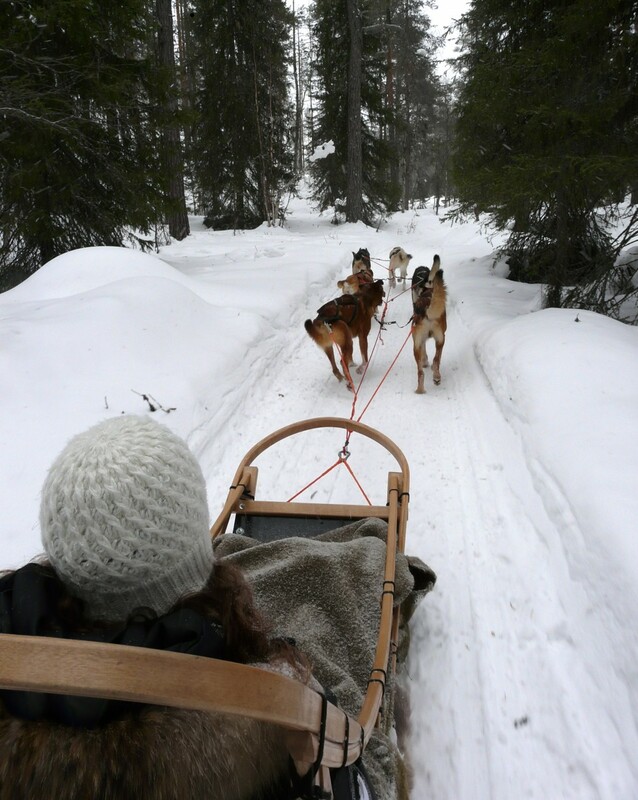 In order to quote on this activity, the owner needs to know how many people will be involved and their individual ages and what they each weigh so that they know how many dogs and sleds to bring. Part of the experience is a training session so it is rather involved but people who have done it have been thrilled. 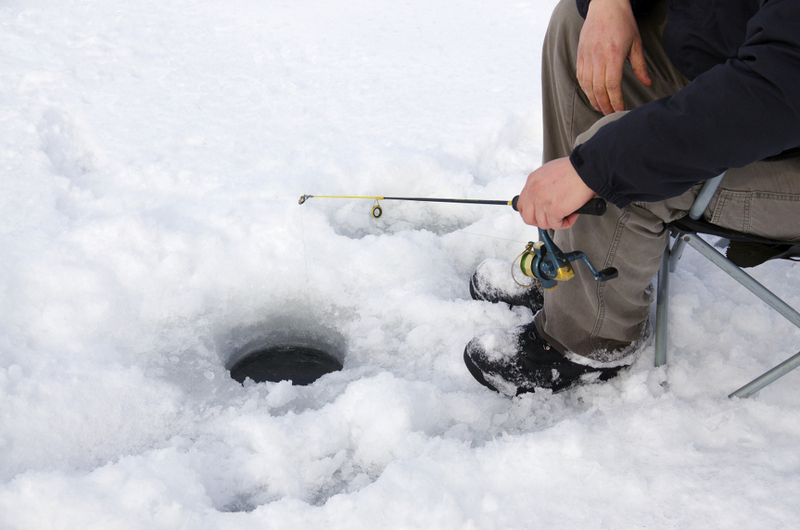 There are good ice fishing spots within view of the picture window looking out over the winter wonderland and a well-equipped bait shop in town 15 minutes away. We can show you some good spots to drill your holes and even help you with that task. 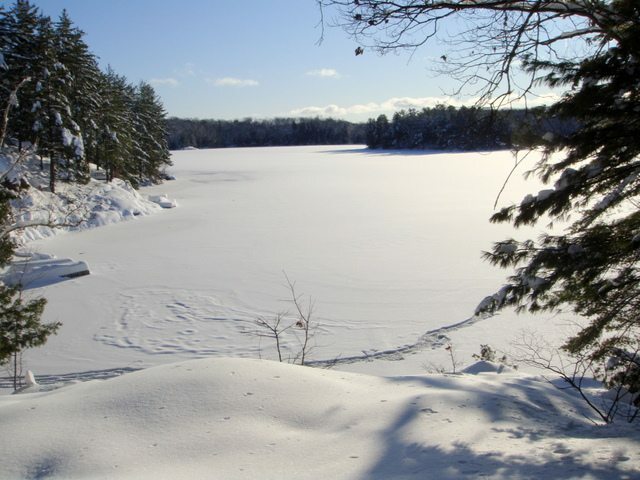 We can show you great places to do cross country skiing on paths through the forest, on nearby roads that are not ploughed in winter or just our on the snow covered lake on a sunny day. 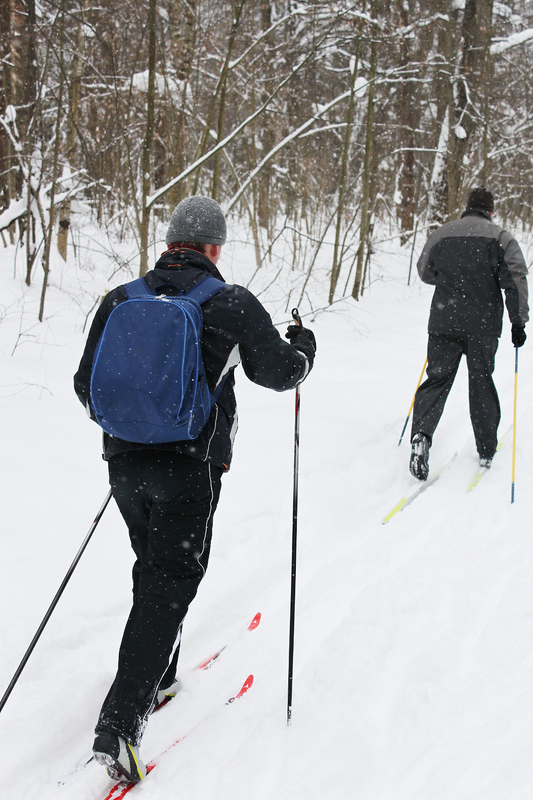 Established trails that are great places to hike in the summer make interesting places to travel by snow shoes too. Some will take you to totally unspoiled lakes that have no cottages and just raw natural beauty.